Panda Express introduces a new, limited-time dish for the Lenten season: Five Flavor Shrimp. 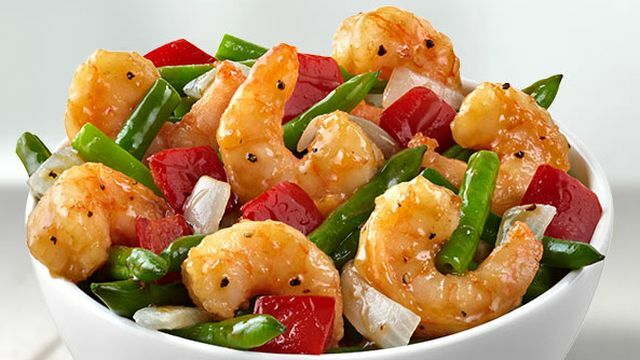 The new shrimp entree features large marinated shrimp, red bell peppers, onions, and green string beans wok-tossed in a "Chinese-inspired umami sauce." According to the chain, the Five Flavor Shrimp is so-named as it "layers five distinct tastes – sweet, sour, bitter, salty and umami – to produce a burst of flavor in every bite." The menu item is inspired by the Shanghainese dish gan shao shrimp (a sweet and sour shrimp dish). Shrimp is a "premium" entree at Panda Express so you can expect to pay $1.25 extra (may vary). The limited-time item is available thorough August 1, 2017.